Purpose of activity: To learn about the ecosystems that exist at various levels in the ocean. 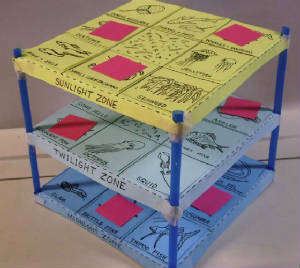 Description of activity: Three bingo boards “stacked” so that the bingo game is three-dimensional. The top board is the sunlight zone, the middle is the twilight zone (where there is very little light) and the bottom is the midnight zone (where there is no light at all). Each board has creatures that live in that zone. Time needed: At least 20-25 minutes to assemble the board. If the students want to color all the creatures, double that estimate. (if you are working with a large group it could take more time because of kids needing help,) Plus however much time you want to spend playing the game. If you are working in class periods, I recommend taking one period to assemble, and another one to play. Kids who struggle with crafts will definitely need a little help assembling this when it comes to putting tape around the straws. Materials you will need: Copies of the pattern pages printed onto card stock, scissors, hole punch, tape, straws, and colored pencils or crayons if you want to color the picture.